As yet no research program has succeeded in producing seedless blackberries. Unless each drupelet--the tiny segment of the berry--contains a fertile seed, that part of the fruit will not develop. Dealing with seeds by tolerating or removing them becomes part of the natural process of harvesting and enjoying this delicious bramble fruit. Separating the seeds from the blackberry means a loss of pulp as well, but juice and flavor remain intact. Fill a mixing bowl half full of ripe blackberries and cover the berries with clean water. Carefully stir the berries with a rubber spatula to float away dirt and debris. Run water over the berries until the overflowing water runs clear. Sort the berries by hand, throwing out any over-ripe fruits or green berries. Discard insect-damaged berries or trim out the ruined sections. Weigh the blackberries and transfer to a saucepan, adding 1/4 cup water per lb. of berries. Heat over medium low heat, stirring occasionally until the fruit comes to a boil. Reduce heat and simmer for five to 10 minutes. Cut two squares of cheesecloth large enough to line the colander, with several inches overlapping the strainer's edge. Place the colander with the double layer of cheesecloth in a large mixing bowl. Crush the cooked blackberries in the sauce pan with a potato masher. Pour the crushed berries into the colander. Press the mash lightly against the sides of the colander to extract part of the juice. Allow the mash to cool to room temperature. Twist the cheesecloth closed over the berry pulp and push down with gentle steady pressure to extract more juice. More pressure adds more pulp and more color to the juice. Discard pressed pulp, seeds and cheesecloth. Refrigerate juice immediately in a clean sealed storage container. 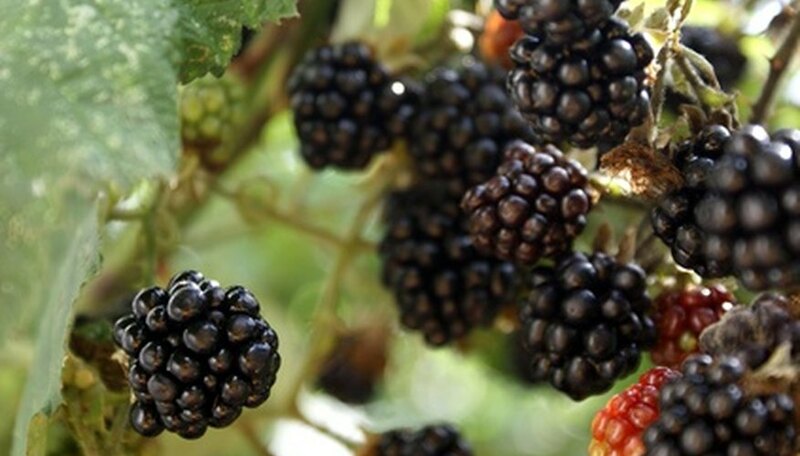 Blackberries change from shiny black to dull black when fully ripe. Many domestic varieties darken early, extending the shelf life of the harvested berry but reducing the sugar content. Handle ripe blackberries carefully since many varieties damage easily. Some juice will be lost if berries are carelessly crushed or bruised during harvest. The softest berries most easily ruined are also the sweetest. Pressing clean ripe blackberries without cooking yields juice suitable for immediate use but not safe for storage even if refrigerated. Use only top quality fresh berries for raw juice.